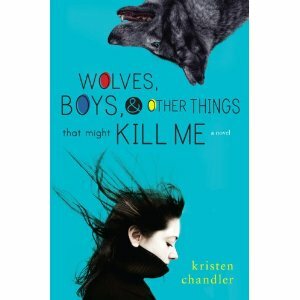 Wolves, Boys, and Other Things That Might Kill Me . Honestly was the worst book I’ve read this year. I wasn’t crazy about the characters, writing or the plot. I really could not wait until the book ended. Virgil was a wimp. KJ never really got into trouble for anything, and if she did, she could easily escape it. I thought the romance between Virgil and KJ had no substance, I kept on thinking they were twelve years of age not seventeen as they were in the book. And the name Virgil annoyed me 'till no end. The only thing I liked about this book was that KJ could be really funny and sarcastic at times. Thats the only thing that kept me reading this book. IT is ALL about wolves. Yes, WOLVES! This novel seemed to be one long advocacy for wildlife. I mean this book would not quit with it's agenda, My eyes rolling and wondering when the actual storyline was going to start but nope, it was really all about wolves and their sanctuary. My advice to you... would be... NOT to waste your time or money on this book. My word to the parents, this book was pretty clean... for full content review checkout Parental Book Reviews. LOL! Thanks for the review! I wouldn't mind the wolves as a running metaphor through the story, but a conservation angle that takes over would be too much.